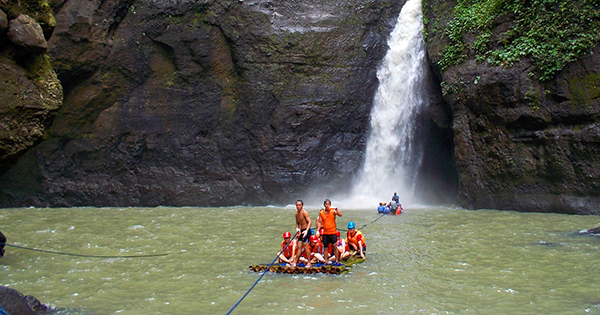 Don’t you just love to take the famous and adventurous boat ride called “Shooting the rapids” towards pristine Pagsanjan Falls, the top tourist attraction in Laguna, which is a province located in the Calabarzon region of Luzon, Philippines. Otherwise, you can reach these scenic three-drop waterfalls via a short hike from Cavinti and have an equally splendid time with nature in the presence of your family or buddy. Reach Laguna through the HM Transport Bus Terminal situated on EDSA corner New York Street, Cubao; or get on the Green Star Bus from Senator Gil Puyat Avenue in Buendia, that is on the corner of Taft Avenue; if not, take the HM Liner Bus from Manuela Metropolis Alabang, Metropolis Mall. Ask the driver or conductor to drop you off at Pagsanjan/Jam Bus Terminal in Barangay Pagsawitan, Pagsanjan, Laguna, when you take the bus destined for Santa Cruz. It takes about two and a half hours to get there from the points of origin mentioned above. Get on a jeep headed for Pagsanjan and alight at your destination. This trip will consume about 20-30 minutes. Then you can take a tricycle ride to your destination. Hop onto a jeep to Santa Cruz from Pagsanjan, and alight at your destination. Get on a jeepney going to Pagsanjan town plaza, and arrive at your destination. Ride a van going to Pagsanjan or Santa Cruz, and ask to be dropped off at Pagsanjan/Jam Bus Terminal in Barangay Pagsawitan, Pagsanjan, Laguna. It also takes two and half hours to go there from Cavite. Upon reaching this terminal, take the Pagsanjan jeepney route and get off at your destination. This journey will take about 20-30 minutes. After that, take a tricycle ride onto your destination. You can hike the El Salvador Nature’s Park and Picnic Grove, also known as Cavinti Eco-Park, located in Barangay Tibatib. You can have a spectacular view of the highest point of Pagsanjan Falls, better known as Nakulo Falls, from the view decks of this beautiful park. To get to the main falls of Pagsanjan, however, you must go down a steep ladder. Furthermore, you may also acquire the amazing chance to take the raft to the falls as well as the shooting the rapid boat ride from the management office found in the park.